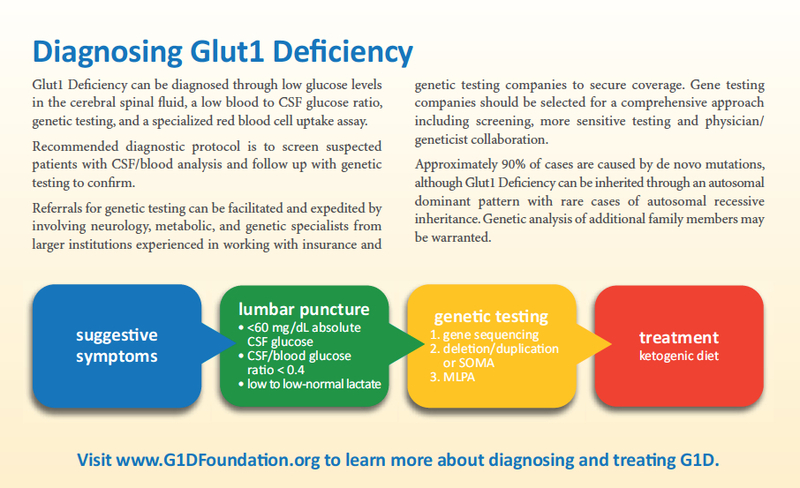 The impaired glucose transport associated with Glut1 Deficiency causes an array of symptoms which may vary considerably from one patient to another and can change and evolve over time. Some of the most common signs and symptoms may include seizures, movement disorders, speech and language disorders, and developmental delays. Not all patients experience all symptoms, especially in the milder cases. There are currently a few hundred patients diagnosed worldwide, but experts believe there are thousands more yet to be discovered. There is currently no cure for Glut1 Deficiency. The recommended standard treatment is a ketogenic diet, which helps improve most symptoms for most patients, even in adulthood. A ketogenic diet gives the brain an alternate source of energy and helps optimize brain growth and development. ​Could it be Glut1 Deficiency? The hallmark symptoms of classical Glut1 Deficiency are seizures (approximately 90% of patients), a complex movement disorder, developmental delay and intellectual disability, and speech/language impairments. There is a great deal of variance across a wide spectrum in both the combination and severity of symptoms from one patient to another, and symptoms may evolve over time. Dystonia 9 and Dystonia 18 are associated with the SLC2A1 gene and are considered part of the phenotypic spectrum. Natural history studies have shown that, in general, seizures improve in adulthood and movement disorders become more pronounced. Puberty often brings changes in symptoms and treatment response.